The white colectivo van left from a small yard just west of the municipal market in San Cristobal. On a chilly morning there was no standing on ceremony, no queuing: when the next colectivo spun around the corner and into the yard, everyone pushed to the front to be sure of a seat. Taken unawares, we stood back and waited for the next one. Half an hour later we emerged into a bustling marketplace. I didn’t remember San Juan Chamula being such a metropolis. Then we heard the explosions, one after the other from the main square. Had we stumbled on a festival? We snaked our way down through the market, where village women in embroidered blouses and wrapped woollen skirts sold fruit, vegetables, crucifixes, hardware, jewellery. Men in white or black shaggy-dog woollen ponchos strode along in their good jeans and best cowboy hats. Foreigners like us tried not to stare. We could not have prepared ourselves for the town square. The church of San Juan Bautista (St. John the Baptist) was festooned with garlands. The church square was thronged with worshippers. I checked the date on my phone, to research later: is the 24th of June the feast of St. John the Baptist? Turns out it is. How fortunate for us. Around the edges of the walled church square thousands more congregated, chatting and drinking at plastic garden chairs and tables, calling to wandering mariachi singers for a five-song serenade, and watching the spectacle unfold. Men in white or black ponchos (serapes) lit rudimentary fireworks with no warning, sending others scattering. One man carefully spilled a thin line of gunpowder in a large L-shape, whilst others followed behind embedding a homemade firework into the gunpowder at brief intervals. No matter what country you are in, the look of childlike glee on men’s faces is the same everywhere when they know something is about to explode. A proper Catholic-looking procession marched around the square, led by a gang of men carrying aloft flags of various saints, followed by others. Some were in the white or black ponchos again, whilst others were dressed in ornate, slightly-medieval-looking black, red and white costumes. Those on the flank carried rudimentary torches of frankincense, the scent of which immediately took me back to the benediction processions of my childhood. A large mariachi band took up the rear. There was no sign of a priest amongst any of this except for a brief period when I saw three tall white men in some sort of vestments receiving the procession outside the church. They disappeared just as quickly as they arrived. 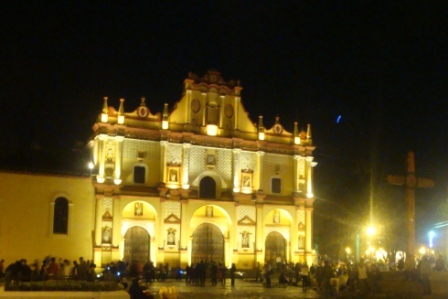 San Juan Chamula is not known for its orthodox Catholic rituals. I wandered closer to the church entrance. By now individual groups were congregating one by one outside the entrance, grouped according to their devotion to a particular saint. Some saints seem to receive less worship than others. These turned out to be the saints of another local church, which was destroyed by fire almost a century ago. The statues were saved by the villagers, but it was never forgotten that the saints had not saved the church. For many years, they were positioned in the church of San Juan Chamula with their faces towards the wall. Their hands were chopped off to show that they had not “worked” to save the church. For some time, they did not receive glass cases, but when new cases were made for the more popular resident saints, the old cases were eventually given to the bad saints. Only in recent years were they allowed to face the congregation and their bodies clothed. After all these years, the number of their worshippers remains small. Why bother devoting your prayers to a saint who doesn’t deliver? Each group of devotees undertook their prayers in a similar way. The men stood in line at the front, then the women, all in the colours of their village: purple, blue, green. They swayed slightly in a stylised dance as musicians played the same eight or so melancholy chords on guitars and ancient-looking harps. Then, group by group they proceeded into the church to worship in front of their chosen saint. The inside of the church of San Juan Chamula is not like any other. No seats, no tabernacle, just glass box after glass box of statues ornately dressed in satins and silks. Santiago, the Virgin of Guadalupe (who had a naturally large following), San Pedro Mejor, San Pedro Menor, Santa Rosa de Lima: the litany continued. Where was Jesus in all of this? Relegated to the status of saint himself, he was represented too. Before Christianity, the Mayans worshipped the Sun God: to change allegiance to the Son of God was not a hardship. Unlike the upright saints, Jesus got to lie supine in his glass case, much like the corpses of dead popes in the Vatican. His glass “coffin” was open at the front, and a young woman stood praying aloud at his head. At his feet were dozens of children’s shoes, presumably offerings following the return to health of a sick child who had been prayed for through the intercession of Jesus. A man knelt at a row of five candles stuck to a clearing in the fresh pine needles covering the church floor. Twenty or so devotees knelt behind him in rows. The first – and tallest – candles were lit. He lit each row candles in succession whilst prayers were recited. Being different sizes, the trick was to let all of the candles burn down and extinguish at the same time. Other devotees offered Coca-Cola, cigarettes or local hooch (pox, pronounced posh) as tributes to their saints. The burping is thought to help expel the evil spirits that reside inside our bodies. Once the worship was deemed complete, the flag-bearer for that saint went to where the altar would be in any other church, as the other devotees packed up and left. One by one, each saint’s flag was being lowered and folded slowly away in wait until the next feast day. The flag bearers then stood to attention with the empty flagpole aloft until all the flags were folded away. Back outside the fireworks were still going strong. Without warning, a large pile of gunpowder detonated on the ground not two metres from where we stood. Orlando and I both leapt a couple of feet in the air and yelped in alarm. A local woman, probably about my own age, in the highly-embroidered purple of her village laughed delightedly at our reaction, her pleasant round face lit up in amusement by her gold-toothed smile. I laughed back at her, our eyes meeting briefly in friendship although we could not speak each other’s language. She probably wondered as much about my life as I did about hers. The celebrations ended as quickly as they had started. We sat at the back of the market, drinking lemonade and watching as the market stalls packed up, leaving just littered concrete behind. Group by group the church and square emptied of worshippers and the gunpowder explosions died away. Between the plastic tables and chairs, quite a few men were sleeping soundly, passed out from the morning’s festivities. The mariachi musicians stood around chatting, their work done for the day, their brass instruments clashing with the rows of silver buttons on their suits in the glint of the afternoon sun. We strolled back up to the bus stop and headed back to San Cristobal, our ears still ringing from the homemade fireworks. We could not have chosen a better day to visit. It took five hours, an increase in elevation of 2,200 metres and a decrease in temperature of more than 20˚C, to make the journey into the mountains to the town of San Cristobal de las Casas. This was a much more interesting journey than the relatively uneventful, sanitised motorway trips we’d undertaken so far. The road wound its way slowly up into the highlands, through small roadside villages and two or three larger towns. As the journey progressed the houses seemed to become much more modest and the living much more agricultural. Most houses were growing some small crops on the land around and between dwellings: cabbages, onions, tomatoes, papayas, bananas, limes and of course the ubiquitous corn. The women often wore traditional dress of an ornately-embroidered short-sleeved satin top, a mid-calf-length (usually black) woollen skirt folded into pleats at the front and held in place with a wide fabric belt tied at the side. More and more men wore cowboy hats. Every village seemed to have a modern basketball court, where the local young men had congregated to play despite the recent heavy rain. Many of the schools proudly announced that they were bi-lingual, Spanish not being the first language of this region of Mexico. The bus careered around sharp bends on a narrow road which often clung to the side of a sheer descent. More than once I had to divert my eyes as my stomach lurched when I could see nothing but fresh air and a vertical drop out my window. The light faded as we approached San Cristobal though a heavy rainstorm. I could feel through the window of the bus that it was very chilly outside. I assessed my clothing and footwear: head-to-toe white linen and a pair of flipflops were not going to insulate me from the chill of a town at twice the elevation of Ben Nevis, at eight in the evening. I shivered in anticipation. Thankfully the rain had stopped by the time we disembarked, and a twenty minute walk through town carrying a sixteen-kilo backpack kept me warm enough initially. We had no hotel room booked, and for once the Lonely Planet let us down with a badly-researched map. The town was crawling with cars, buses and people: with the wet ground, the chill in the air and the shops all lit up in the twilight I had a real sense of Christmas shopping in Dublin city late on a December Saturday afternoon. What could possibly be going on, on a random Thursday evening in June? The receptionist in the Hotel LiquidAmbar explained all as we checked into a tiny but immaculately-clean room overlooking the reception area: it was the feast of Corpus Christi. We dumped our bags, threw on as many extra layers as we could find, and headed out into the evening’s festivities. We were a block away from the cathedral square, where the façade of the cathedral was lit up spectacularly. Hawkers from the neighbouring villages kept stalls or wandered the crowd selling multi-coloured shawls, embroidered belts, woven bracelets and other textiles. Along one side of the leafy Plaza de 31 Marzo, an arched walkway was ablaze with lights and crowded with people: we squeezed in through the throng, to find the walkway lined with sweet sellers, their stalls piled high with every kind of cake imaginable. 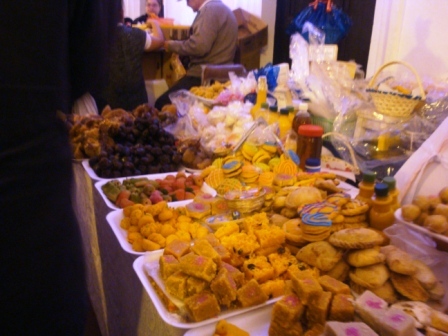 Honey-drenched offerings looked very like Indian sweets; tray after tray of perfectly-formed fruit miniatures made from marzipan tempted the passers-by. Orlando spoke to one old lady – most of the stalls were run by several generations of women from the same family it seemed – and chose three cakes to try later on. We strolled down Avenida Hidalgo, past terracotta-roofed restaurants and cafés with people sitting outside, clearly shivering with the cold and inadequately dressed for the altitude. It reminded me of Melbourne in winter, with the whole population in denial about the good sense of sitting outside in mid-winter. Back north of the Plaza Grande, Av. Hidalgo turned into Av. 20 Noviembre. Still pedestrianised and touristy, its side streets gave the occasional tantalising glimpse of Iglesia San Cristobal on a hill outside town. We stopped at a taco place – well, it was either more tacos or the more international choices of sushi or pizza – and devoured five tacos de pastor and five of chorizo and cheese. We then declared our love affair with tacos over forever: you can, it seems, have too much of a good thing. The scalding hot tea was great, though, on such a chilly night. 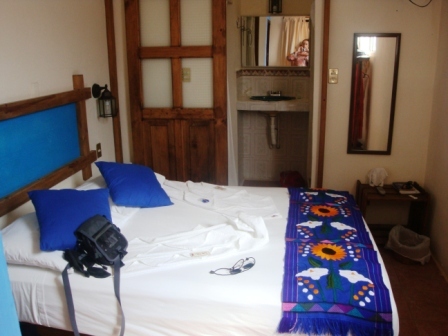 Back in our room we warded off the cold in bed with two thin blankets which were barely sufficient to warm us up again. Eventually I hid completely under the bedclothes and snuggled up to Orlando in yet another (barely) double bed, before sleep finally came. Tomorrow night, I promised myself, I would steal more blankets from the empty room next door. 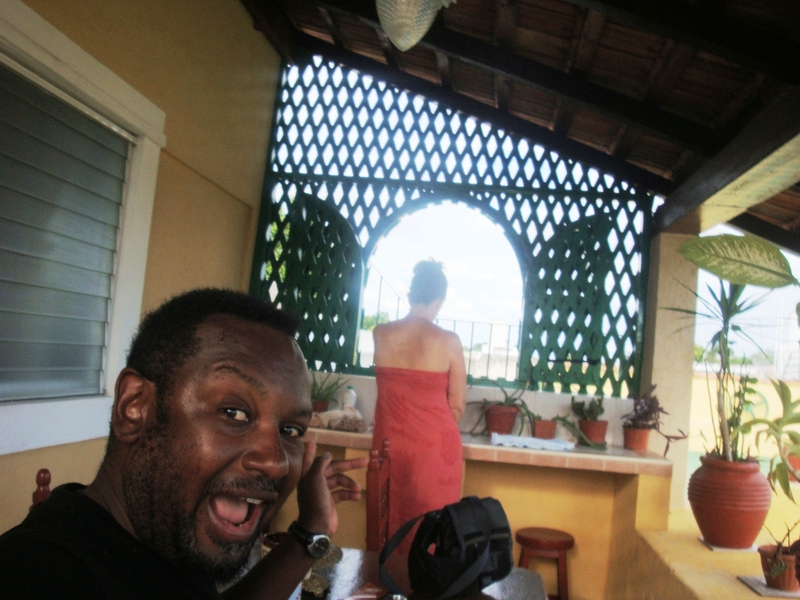 A thirty-peso taxi ride took us from the bus station in Mérida to Casa Alvarez, a friendly guest house run by the lovely Enrique and Miriam, and Charlie the cat. We were given the “penthouse” for the same price as a regular room – they must have liked the look of us. 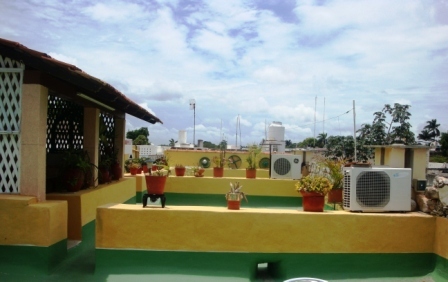 After our rather more basic lodgings in Tulum and Chichen Itzá, we felt surrounded by luxury: our own rooftop cabin, an enormous king-sized bed, a lounge area, a fridge, air-conditioning, a lovely little veranda surrounded by potted plants and an enormous roof garden to ourselves. We immediately set out to explore the pretty market town, heading down past the busy Plaza Grande to the Municipal Market. There was more than a touch of southern Spain to the town, from the architecture to the beautiful stuccoed churches and pavement cafés. The market sold mostly food: fish and seafood, fruit and vegetables, and a handful of other stall selling hardware, clothes and other goods scattered in between. Not having had breakfast, Orlando stopped at a stall and had three beef tacos, whilst I headed back to the fish market to pick up my first cocktail de mariscos of the trip. 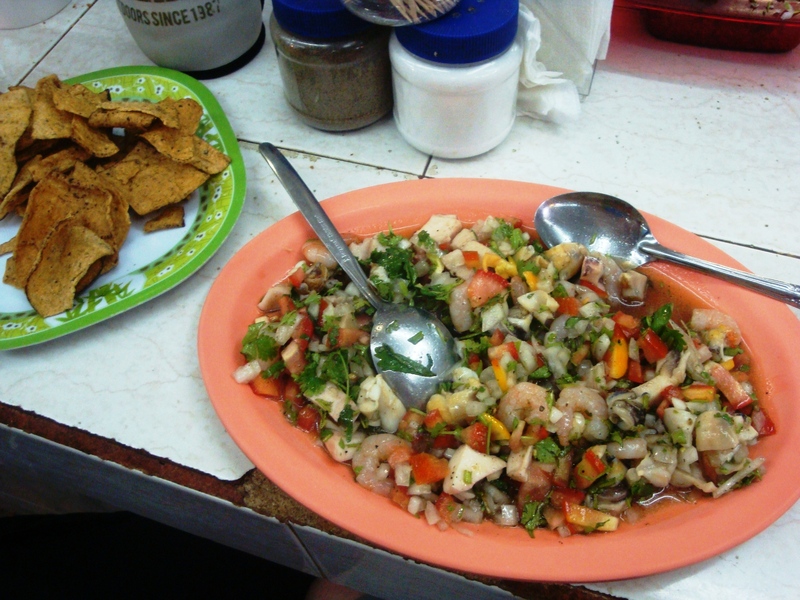 My stall lady mixed chopped octopus, calamari and prawns together with chopped onion, chopped tomato, salt and pepper, coriander, and squirt of olive oil and – the surprise ingredient – a squirt of Worcestershire sauce. A tasty dish. Add a spoonful or two of homemade habañero salsa – onion, tomato and chopped habañero chillies – and mop it all up with a basket of fresh tortilla chips. Perfect. After doing a few chores and getting our bearings, we headed back to the room to (literally) chill out and relax out of the searing heat and humidity. I took real pleasure in standing at my little outdoor sink on the veranda and doing a pile of laundry by hand. I think Orlando appreciated my handiwork too. A dip in the little pool downstairs rounded off the afternoon and cooled me down. I took pleasure just sitting with a mug of coffee on the veranda watching all my laundry dry, and admiring the successful results of my attempt to bleach my poor linen trousers back to blazing white. Later in the evening we watched the sun set from the roof garden as the lights came on across the city. 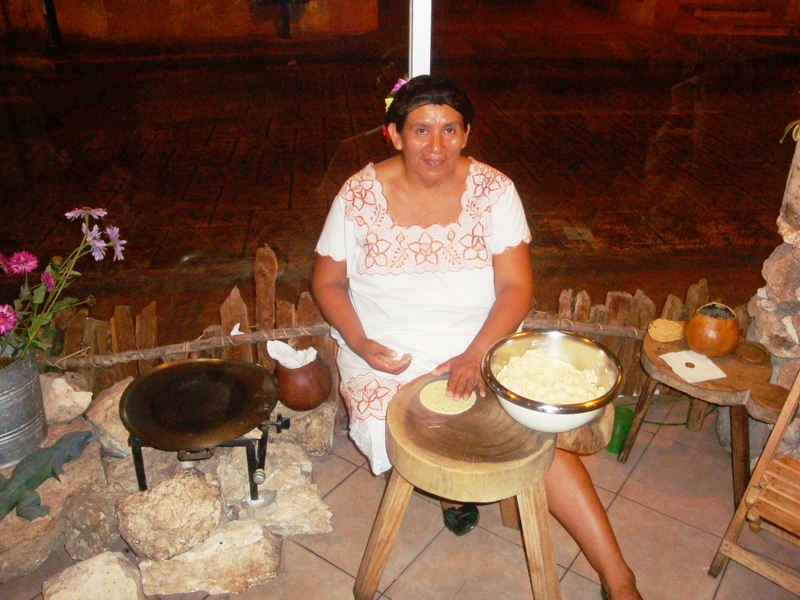 La Chaya restaurant served up good Mayan food to locals and foreigners alike, with three women employed to sit and make tortillas by hand in the full view of the diners. 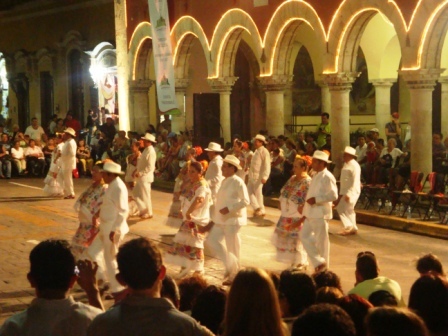 The Plaza Grande was alive at nine o’clock in the evening, with a cultural performance of traditional jarana dance taking place for free outside the Palacio Municipal. A dozen or so women, dressed in immaculate traditional huipiles and underskirts, white high heels and flowers in their hair, were escorted by the same number of courtly gentlemen wearing white trousers and tunics, a red bandana tucked into their waistbands, simple white sandals and a Panama hat. The dancing couples rarely touched except at the start and end of each dance. The men escorted the women to their starting positions, bowed slightly and raised their hats before taking up their own positions. At the end, they took the women’s arms and escorted them back to their seats on the veranda of the palacio. Most of the dances were fairly sedately-paced, which was appropriate given the age and relative girth of some of the dancers, not to mention the heat and humidity. Their performances were punctuated by another gentleman, similarly attired to the male dancers, who recited patriotic and comedic poetry with a passion much to the delight of the audience. A turn around the gardens of the Plaza Grande and a leisurely stroll along a quieter avenue lined with old university buildings, cafés and small churches ended our evening. Back at our room I folded away all our clean clothes and made us a cup of tea in the little kitchen downstairs. It was nice to have a bit of luxury at last. 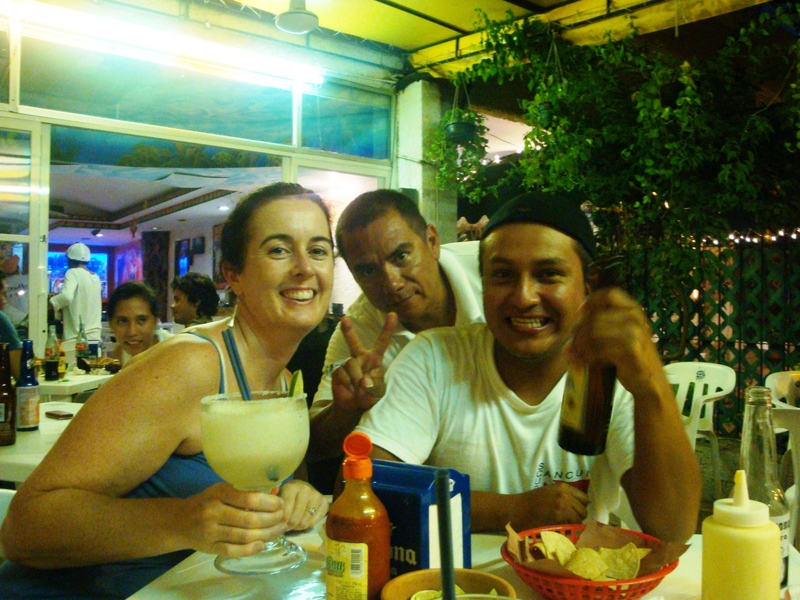 We arrived in Chichen Itzá in the early afternoon after an uneventful two-hour bus ride from Tulum. The free left-luggage room in the ancient ruins complex was unexpected but welcome, so we opted to explore first and find our hotel later. On a Sunday afternoon the place was thronged with busloads of Mexican and foreign tourists, including the USA National under-18 basketball team. We ran the gauntlet of multiple confusing ticket desks – as foreigners we needed tickets from both federal and state governments – and made our way finally through the turnstiles. 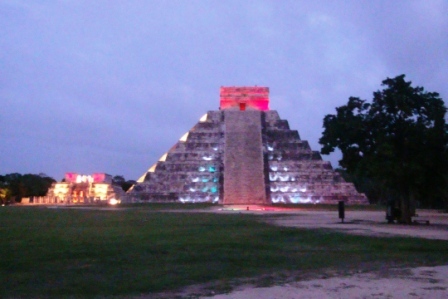 We walked through the trees as the centrepiece of Chichen Itzá was slowly revealed to us: El Castillo (the Castle) stood alone in a large clearing, towering thirty metres above us, an icon of the ancient Maya. The nine separate levels of the pyramid decreased in size as they approached the temple at the summit, whilst an almost perfectly-restored steep staircase of ninety-one steps drew the eye skywards. Even with the hundreds of other visitors and throngs of souvenir-sellers chanting “only one US dollar, amigos” El Castillo was magnificent. 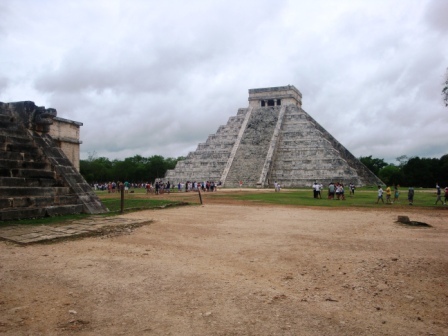 The last time I was here in the late nineties visitors were allowed to climb right to the top, but this time it was roped off like almost every other structure in the Yucatán Peninsula. Blessed with another cloudy and relatively fresh day, we strolled the site for hours, visiting the huge ball court, the Thousand Columns, and more. With only the brief notes of The Book (our trusty Lonely Planet) to guide us, we no doubt only scratched the surface of the rich history of the site, but the carvings on the ruined buildings spoke for themselves. Ornately-decorated kings stood on the crumpled bodies of their captive subjects. Serpent heads formed the end-points of steep banisters carved to depict the scales of the serpent. 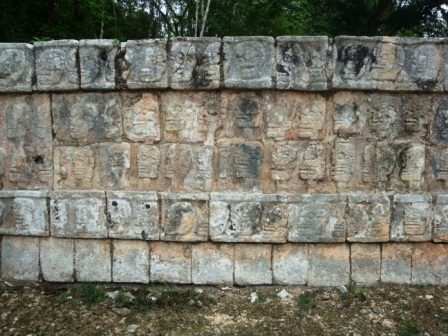 One ruin was carved around the base with hundreds and hundreds of human skulls. Over by the Thousand Columns, a vantage point on top of the Temple of the Warriors housed the famous reclining figure of Chac-Mool, a minor deity, waiting to carry away the hearts of those who have been sacrificed to the god Ku. Looking for all the world like a sunbather on his back but now leaning on his elbows to look out over his shoulder, more eroded and damaged versions of him are to be seen all over the site, and replicas in hotel gardens and on roundabouts all over the Yucatán. For a time we happened across the same two young Spanish-sounding dudes every place we stopped. Barefoot and bare-chested, they strolled about wearing only loose-fitting cut-off cotton trousers and impressive dreadlocks. Clearly used to travelling light, we surmised, but surely they could have found room amongst their meagre belongings for some soap and a deodorant stick? We made sure to stay well upwind when we could. The archaeological site went on and on. Through another break in a wall or down another footpath we found more and more to see. Yet more columned balustrades; a ruined steam house for ritual purifications; a pyramid-shaped ossuary; the ruined remains of the building where all the ceremonial food had been prepared. The Observatory was amongst the most impressive, with half of its original domed roof still intact. The windows in the dome were exactly placed so as to frame Venus in the night sky at astronomically auspicious times. Another building, the Nunnery, still had most of its ornate stone carvings intact, and stood beside La Iglesia, a large temple structure with a huge staircase leading to the top. It was smaller than El Castillo but impressive nonetheless. 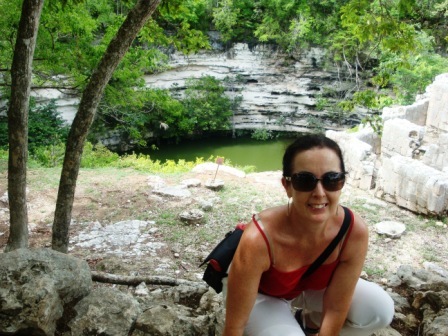 Before we left, we headed back to El Castillo and followed a dead-straight path due north towards El Cenote Sagrado or Sacred Cenote. The path was lined with souvenir sellers, and small children approached us selling cotton handkerchiefs, tine replicas of El Castillo or little contraptions that, when blown into, make the sound of a snarling jaguar (jaguar imagery is almost as prevalent as serpents at Chichen Itzá). 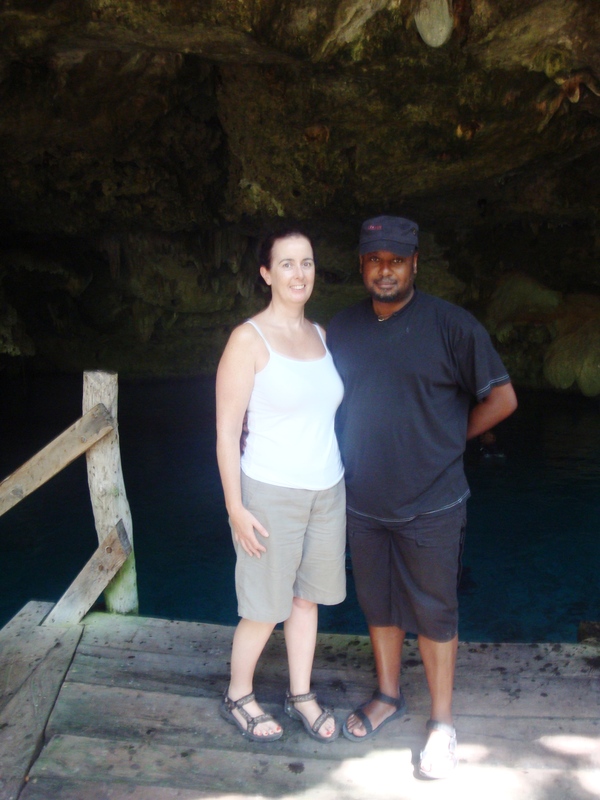 The cenote itself – sixty metres in diameter with opaque green water at the base of twenty-metre cliffs – was spectacular and awe-inspiring. 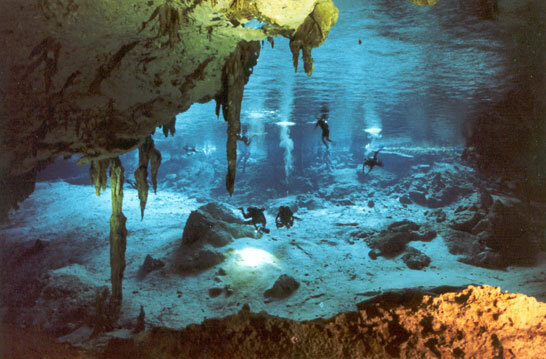 It is said that many sacrificial victims were thrown into the cenote as gifts to the Mayan gods, as well as untold treasures offered as appeasement or tribute. We gazed down into its murky depths before taking our leave for the day to find our hotel. A five-minute taxi ride into the small village of Pisté found the Píramide Inn. Run by a Baby Boomer American couple, it’s a little run-down but perfectly pleasant with large gardens, a pool and some genuine Mayan ruins out the back. I immediately went to check out the pool, with was a little leaf-blown but clean, cool and refreshing after a long afternoon strolling the ruins. Orlando had a nap while I showered and relaxed on the balcony with my book. Around 7.30pm it was still light as we wandered slowly back towards the ruins for the Son y Lumiére show. Orlando brought a long-sleeved shirt and I took along a wrap in case of mosquitoes – well, we were in the middle of the jungle. The show – all in Spanish – started almost as soon as we arrived. I didn’t catch all of the commentary, which appeared to be partly historical detail, partly dramatic performance, but the atmosphere was powerful, with the imposing presence of El Castillo and the other structure all around, and the spirits of the Maya just out of reach. The walk back to the hotel would be less than twenty minutes. The road was well-lit and a steady trickle of cars meant that we would not be alone on the dark jungle road. No, problem, we thought, and set out happily. After no more than a couple of minutes we realised the awful truth: we were far from alone on that dark road. In fact, we were walking through a veritable fog of flying insects, huge brown beetles, even bigger green-black ones, and a good handful of saucer-sized creamy-grey monster moths. They moved slowly, colliding with us at every step. They flew right into our faces and hair, their low buzzing sounds heard too late to take any evasive action. Where the light was stronger – under the very street-lamps we had seen as our allies – they were impossible to escape as we stumbled shrieking through literally thousands of the awful creatures. Suddenly our long-sleeved garments and my wrap meant more than protection against mosquitoes: I do not believe I could have made it back to the hotel in one piece without all of my body being covered, however scantily. It didn’t stop countless huge crawling things landing on my neck and on my shoulders where their weight, clawing at my sheer chiffon wrap was too much to bear. It was the longest three kilometres either of us has ever walked. After what felt like an age, we saw the lights of the State Police checkpoint ahead and knew we were almost home. The policeman was sitting quietly in the dark a hundred metres or so from his post, in the shelter of an abandoned trader’s stall. He waved goodnight as we passed. Then it became apparent why he was not at his post: lit up like a Christmas tree, his little sentry box was besieged by an enormous black swarm of night creatures, swirling angrily like a single living being, making a mockery of what should have been his sanctuary. One look passed between us, and wordlessly we crossed to the other side of the narrow road which was not quite so well lit. Heads down, we dashed the hundred or so metres past the black swarm, and into the relative safety of our hotel. We had made it. There was one more hurdle to surmount. We had left the light on outside our room. As we approached the end of the terrace towards our hotel room door, our horror returned as we saw hundreds more of these flying creatures swarming for yards all around our lamp, and coating every surface: the ceiling, the floor and the door itself. How were we to get through? There was no time to lose as they began to land on our clothing again; we swiped them away with revulsion. Orlando tried to clear a path to the door by scraping a balcony chair back and forth, but to no avail. Then in desperation he unlocked the door, shouted “Go! Go! GO!” and we bolted inside. We inspected every inch of each other for interlopers, killed one innocent-looking flying thing, and collapsed on the bed in exhaustion. Next time, we’ll take a taxi.